Thomas Landscape service is located in the center of the Bitterroot Valley in Stevensville, Montana. 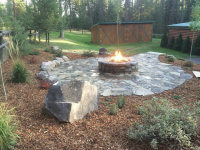 This central location gives us the opportunity to provide custom landscaping design services to all of Western Montana. With focus on functionality, aesthetics, excellent quality control and attention to detail, our professional landscape team transforms your ideas into a beautiful outdoor area that will enhance your lifestyle and reflect Montana’s natural splendor. The materials we use, types of boulders for example, are chosen specifically for your landscape so that they blend seamlessly into your outdoor area. Plants and trees chosen for your landscape are Montana grown and have a proven track record of performing well in our climate. 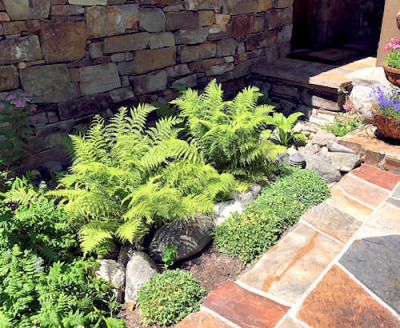 We offer all aspects of landscape design and construction - From re-establishing native grasses, plants, and trees, to creating a backyard oasis, as well as the complete design and installation of the landscape for a new home or business. Outdoor living areas can offer as much interest through late fall and winter as they do in spring and summer. The use of ornamental grasses add texture and interest whether planted as a focal point or placed among flowers and shrubs. Deciduous shrubs are a must in the landscape. Shrubs like barberry put on a four season show, from their spring blossoms, vibrant summer foliage, berries in the fall to a lovely silhouette when snow-covered. Great customer service is an aspect of the landscaping business that we take very seriously and we continually strive to meet and exceed our customer's needs. Relatively low overhead and knowledge of local materials enables us to provide you with excellent service at an always competitive price. We will replace any tree or shrub that dies from natural causes within one year of planting. Notify Thomas Landscape, LLC within one year of planting date and we will provide and plant equally priced substitute at our cost. No cash refunds. Death caused by wildlife does not constitute “natural causes”. We can address all your landscaping needs including lawn maintenance and sprinkler systems. Eco-friendly design solutions that minimize maintenance and conserve resources.